Bulgaria is situated in the Southeast part of the Balkan peninsula and extends on 110 912 km2 area. The population of the country is 7.85 millions citizens. Bulgaria borders on Greece and Turkey on the south, Macedonia, Serbia and Montenegro on the west, Rumania on the north, and Black sea on the east. International highways connect the country with West Europe, Russia, Asia minor, Adriatic, Aegean and Black seas. Bulgaria has a rich history, which goes back to the ancient times. The archaeologists find these days in lots of places on the territory of the country tombs and gold treasures, left from the first inhabitants of the Bulgarian lands – the Thracians (6-3 Century BC). The Bulgarian state was established in 681 BC, and was one of the first states in Europe. It experiences periods of development and flourish. During one of them reigned by Tsar Simeon I (893-927) Bulgaria became the only master in the eastern region of Europe. During the reign of Tsar Ivan Asen II (1218-1241) Bulgaria had outlets on three seas – the Black, the Aegean and the Adriatic sea. In 855 Kiril and Methodius brothers created the Slavic alphabet, which gave the basis of the Cyrillic alphabet, and in 865 Bulgaria adopted the Christianity. The cultural heritage from ancient times up to these days will help you get to know our rich history. The Bulgarian nature will charm you with its variety of beautiful mountains, golden beaches, torrential rivers and crystal lakes. The climate is distinguished for its mild winter and a fresh summer. The mountain resorts dispose of attractive ski-tracks, and the beaches along the Black sea coast are preferred for a summer holiday. Our main objective is to work professionally and correctly for the interests of our clients, because any purchase of a real estate is an investment in the future – whether long-term or for a shorter period of time, it is quite significant for the client. 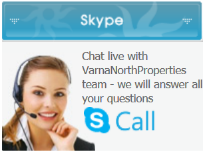 Therefore, “VarnaNorthProperties” team is motivated to exert maximum effort and with utmost responsibility. We shall submit to you offers for properties, among which you shall find the one meeting your demand. We shall give you professional advice, we shall orientate you, we shall point out the advantages and the shortcomings of each property, but we shall leave on you the choice of final decision. Because that will be your property! We shall be always with you until the finalization of the transaction and after that also, if you wish so, and we deeply appreciate and are grateful for your trust in us! management and maintenance of the real estate purchased by you.